The warm weather continued through yesterday and last night was particularly mild, at breakfast this morning we had all the doors of the dining room open and the air temperature was 15⁰C as we started on our scrambled eggs and bacon. I went up by boat to Middle Camp last night and was again struck by the extraordinary amount of water running down the small streams into the river. The river is quite dirty, especially below the Middle Camp Island and I’m sure that is what is making the fishing so tricky at the Lower Camp. Up at Middle they had a good day with 96 salmon landed to the eight rods. They were very cheerful and Jemima produced a fabulous dinner finished off with Crepes Suzettes flambé with the Grand Marnier she had asked me to find in Murmansk. Julian T continues to lead the score, I’m not sure quite how he does it, all our guests are fishing pretty much with the same flies and lines (a fast’ish sinking tip, short leader and a reasonably heavy large, bright fly). The general agreement over dinner was that ‘he presents the fly beautifully on each cast’ – I reflected on this coming back down the river and thought how nice it was to have a team of fishers who recognized that sometimes fishing is not just luck and that skill does play a part and that Julian deserved credit. At Lower we had another difficult day, albeit we got into double figures with 10 salmon landed, David K-W getting the second hat-trick. 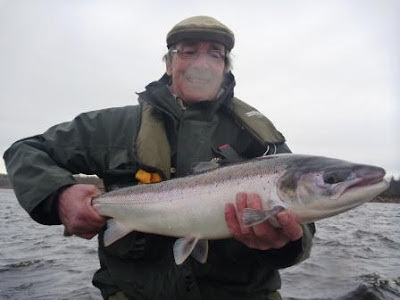 Never, in all our time here, have I thought that just three salmon in the day to one rod would be a Varzuga Celebration. Jesse too had a go in a few places with no result – it has been really tough, unusually so in this unprecedented high water. We are seeing fish, and with the water temperature around 3⁰C to 4⁰C we ought to be catching them, but is just not happening. That said the river is now settling down and catches will increase each day. 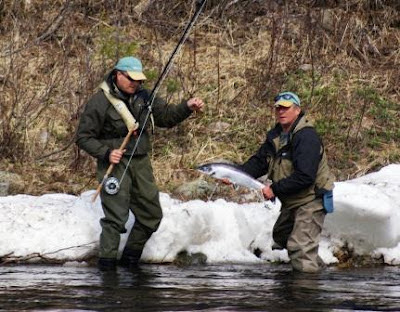 Charlie and I took the decision that, for the first time for 21 years, we should fully refund the cost of the fishing to our 10 guests here at Lower camp - such is the nature of the huge spring flood we have had, coupled with the first two days being almost unfishable due to ice. Some of the team here, and I am thinking of Alan and Michael, have fished with me on this week since the early 1990's - never have we seen quite the size of river we had yesterday. We have a wonderful, warm day here now, the streams are still running but much less so than yesterday and there is an air of optimism about the guides for the coming week. The water height is steady this afternoon - good news given the warm weather. We leave for Murmansk early tomorrow, if we can we will update you this evening or early tomorrow. I suspect that on Sunday our new guests will have a a great start to their week and will wonder why we struggled.